Drink, Shop & Dash is the smaller sibling and speciality coffee outlet of next door neighbour, Drink, Shop & Do. Located on the Caledonian Road, just around the corner from King’s Cross Station, it joins a growing band of speciality coffee in the area, led by the (now venerable) Caravan. There’s not a lot to Drink, Shop & Dash, the “dash” element of the name betraying its small size. However, despite the name, it’s more than just a takeaway joint, with enough space for a couple of two-person window-bars, one each side of the door. Opposite the large windows is a generous counter, with plenty of space for those who have opted for takeaway to wait for their coffee. The output is also worthy of a much larger establishment, with coffee from south London’s Volcano powering a decent espresso-based menu (Volcano’s seasonal espresso blend or decaf), plus single-origins on bulk-brew filter and pour-over. There’s also loose-leaf tea and, while it’s still summer, iced coffee and tea to go with frozen yoghurt. If it’s food you’re after, you’re also well catered for, with toast and muesli in the morning, sandwiches and soup at lunchtime. There’s also a small selection of cake. September 2015: Drink, Shop & Dash closed at the end of August, to be replaced, for an initial three-month period, by Lanark Coffee. There is potential for the arrangement to become permanent next year. 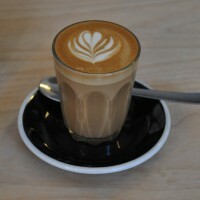 See my update on Lanark Coffee/Dash for more details. Drink, Shop & Dash (Dash for short) opened in January of 2014, along with its much larger (and multi-functional) sibling, Drink, Shop & Do. From the street, it cuts a dashing figure, its plain front enlivened by various slogans written over both windows. Indeed, writing seems to be a feature of Dash: I don’t think I’ve ever seen a coffee shop where so much of it has been written on! As well as the windows, there’s writing on the front of the counter. The menu is written on a long, thin board above the counter. There are boards on the left-hand wall, listing the tea, coffee and sandwich options. There’s even an A-board outside. If that wasn’t enough, tasting and origin notes from Volcano are stuck on the espresso machine for the three main blends/beans. Given its small size, Dash manages to convey an awful lot of information! Talking of size, there really isn’t much to Dash. Stepping through the door, you’re greeted by the counter. Behind you, to the left and right, are two window-bars, but the space between you and the counter is open, leaving plenty of room for those waiting to order or collect coffee. There’s even space on the left-hand wall for a set of shelves with a comprehensive selection of beans and coffee kit for sale. The counter has cakes and sandwiches to the left, clustered around the till, and espresso machine and grinders to the right. The espresso machine is a Rocket. I’ve long lusted after Rocket’s range of (expensive) dual-boiler home machines, but this is the first commercial machine I’ve seen in action. Everywhere you look, Dash’s coffee credentials are on display, from the array of filter methods behind the counter to the sign proudly proclaiming the weekly coffee-cupping sessions each Saturday at 11 o’clock (£10 per person, book in advance). Since I was already very fond of Volcano’s output from several visits to The Dry Goods Store, I challenged general manager and head barista, Sebastian, to make me something that showed the coffee off to its best. I received a single shot of Volcano’s spring espresso blend (50% Tanzania, 30% Peru, 20% Nicaragua) for my troubles. This was a sweet, smooth coffee that sufficiently impressed me that I decided to try it with milk. I returned to my seat with a (double shot) piccolo that was just as impressive, the sweetness of the milk blending with the inherent sweetness of the coffee. If espresso’s not your thing, then Dash also offers a bulk-brew option, pre-brewed in small quantities, or, if you have the time, an individual hand-made pour-over. While I was there, the Tanzania bean (part of the espresso blend) was on the bulk-brew filter, while an Indian Araku Emerald bean was available through a wood neck filter. Sebastian told me that he rotates the single-origin beans on a monthly basis, with the hand-pour option being paired with whichever method (V60, Aeropress, Chemex or Wood-neck) best suited the bean. He’s also looking at introducing guest roasters for the filters. There’s also food: I had an excellent cheddar and apple toastie. The bread was nice and crisp, while I could really taste the cheddar. Best of all was the really zingy chutney which gave it a real kick. Update: with my usual brilliant timing, I found out that Dash had changed its coffee from Volcano to London’s Alchemy the day I posted this Coffee Spot! And there was me waxing lyrical about the Volcano coffee! So, the following day, since I was on my way to St Pancras to catch the Eurostar to Paris, I thought I would dash in and try the new coffee. I was well looked after by baristas Sam and James, who gave me a shot of the Elixir Espresso Blend to try. This is 50% Ethiopian Chelba, 25% Ethiopian Korate and 25% Costa Rica Rio Jorco. The tasting notes suggested that I wouldn’t like it much, but it was surprisingly pleasant, especially on the second mouthful. It was quite fruity, but unexpectedly rich and complex, with none of the sharpness and acidity I so dislike. I also tried the bulk-brew Wote Ethiopian Yirgacheffe. Unfortunately I really was rushing, so I didn’t have time to let it cool properly, which is when I suspect it would have come into its own. As it was, it was a full-bodied cup and very drinkable. Although Dash has changed roasters, it still has the same coffee offering, with the Elixir blend and a decaf on espresso, bulk-brew filter, and a couple of single origins available as pour-overs (which I would have tried if I had had more time). Interestingly, there was a Costa Rican Angelina West Valley bean available both as washed and honey process. Again, had I had more time, I would have loved to have compared the two. Note that the location shown on the map is for Drink, Shop & Do. Drink, Shop & Dash is next door. You can, if you like, see what fellow-blogger Hannah Hoskins makes of Drink, Shop & Do. This entry was posted in Breakfast, Cake, Closed, Coffee Shops, Lunch, North London, Sandwiches, Stations Nearby by Brian Williams. Bookmark the permalink.